There's no question as to why the Easton line is one of our more popular patterns. From its clean, beautiful design, to its bolstered handles, to its beaming finish, this is a striking set. Easton flatware looks amazing at any occasion - fun, formal, fancy, and everything in between. 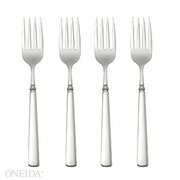 Oneida's 18/10 fine flatware combines genius design along with durable materials that will last a lifetime.